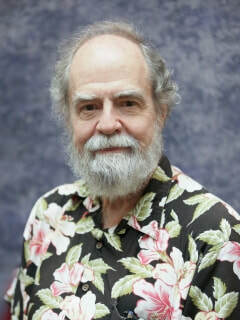 Jim Gunn is Eugene Higgins Professor of Astrophysical Sciences, emeritus, at Princeton University. He has been active in theory, observation, and instrumental development since the start of his career in 1965, when he received his PhD from Caltech. After a brief stint as a junior faculty member at Princeton in '67-68, he returned to the Caltech faculty and then in 1980 returned to Princeton, where he has been since. Early on in his career he worked on the general relativistic foundations of weak gravitational lensing and the physics of the intergalactic medium. His work with Bruce Peterson on the spectra of high-redshift quasars led to the discovery of what is now called the Gunn-Peterson effect. Later he demonstrated that relatively low-redshift quasars are often found in clusters of galaxies at the same redshift, thus demonstrating the cosmological nature of quasar redshifts. Cluster physics and cluster cosmology were a major interest at the time, and he and a number of collaborators began a search for and study of distant clusters, culminating later in a catalog which went to redshift unity. It was this work which first showed clearly the evolution of the population of galaxies in clusters, from vigorous activity at early times to quiescence today. While still at Princeton, he began with Jerry Ostriker work on the inclined dipole model for pulsars, and studied for the first time relativistic electron motion and radiation in the 'nonlinear' electromagnetic waves produced by such objects, waves which are so strong that the electron gyrofrequency is larger than the wave frequency. A study in 1975 with Tinsley, Gott, and Schramm consolidated evidence from many prior studies and concluded that Omega in matter was of the order of 0.2 and the Hubble constant was of order 70. He developed with Roger Griffin a photoelectric correlation radial velocity instrument, capable of measuring radial velocities of faint stars to of the order of 100m/s, and applied it to the study of internal motions of stars in clusters. This resulted in accurate dynamical models of several globular clusters, the first measurement of the velocity dispersion in open clusters, and a study which yielded the then most accurate distance to the Hyades, as well as hundreds of binary orbits. The interest in the Galaxy led to a study with Jill Knapp of the structure of the Milky Way from 21cm data and new estimates of the rotation velocity, 220km/sec, and distance to the center, 8 kpc, which are near the now-accepted values. Shortly after Weinberg pointed out the existence of the 'Wimp miracle', pointing to the possibility that the dark matter might well be a weakly-interacting stable neutral particle left over from the GUT epoch, Gunn and collaborators did the first work pointing out the profound cosmological effects of this picture (now called CDM) and the solutions it offered to the pressing galaxy formation questions of the time. It was during this time in the middle to late '70s that CCDs were being developed, both commercially and by NASA, and Gunn and Jim Westphal took advantage of the connection of Caltech and JPL to work with NASA on the development of the sensors and so were present from the beginning of the CCD revolution. Gunn built the first dedicated CCD instrument for the 5-meter Hale telescope, a parallel-beam combination camera and spectrograph. This instrument was used for the cluster work and, with Schmidt and Schneider, a quasar search using slitless spectroscopy in the newly developed transit mode, which found the highest redshift QSO known at that time, at z=4.76. When the Wide-Field camera was opened to proposals from the community in the middle 70s Gunn and Westphal proposed to build a CCD instrument using 4 of the devices being developed at JPL for the Voyager mission and won the contract; Gunn was deputy PI on the camera until the early 90s. A prototype of the camera with the same optical principle was built for the 5-meter, called 4-shooter. Later Gunn built a spectrograph for this instrument, and it was used to study clusters at redshifts approaching unity and also discovered, again with the transit technique, a quasar at 4.92, which held the redshift record for many years. resource for the science since, and is still very widely used for major extragalactic studies. There are surveys on larger telescopes now underway which will supplant it in a few years, but it will remain an important resource for a long time. The spectroscopic instrumentation, now supplemented with a high-resolution infrared fiber-fed spectrograph (APOGEE), is still unique, and the survey is just beginning its fifth incarnation, SDSS-V.
Gunn has been widely recognized for this work, and has received the Crafoord prize from the Swedish Academy, the Gruber cosmology prize, the Petrie prize of the RASC, the Gold Medal of the RAS, the AAS Russell lectureship, a MacArthur fellowship, and the National Medal of Science. He is now currently heavily involved in the development of the Sumire-PFS spectrograph, a 2400-fiber faint object instrument to be installed on the Subaru telescope. This will be used for, among other things, an SDSS-like survey in conjunction with a large CCD imaging survey now underway with the Subaru HSC camera, a recently completed camera with 112 large CCDs. The hope is to do SDSS-like science through the period of the universe during which nearly all the matter we now see in stars was incorporated into galaxies, from redshift 2 to the present. The SDSS is a census of the universe today; the new survey will, it is hoped, write the history book.